It has all been leading up to the Day of the Dead. 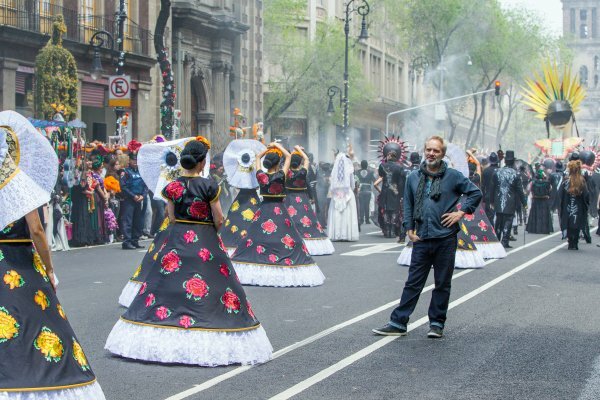 It’s Sam Mendes’ fourth day of shooting the opening sequences of the new James Bond movie, Spectre, on location in Mexico City. Thousands of extras (1,500 to be exact), donning traditional face paint, parade down the street in celebration of the Mexican holiday. They’re moving to the beat of the drummers banging away on an ornamented stage surrounded by acrobats. And emerging from within all the raucous is an epic chase between 007 and his target. This is the only day throughout the entire production of Spectre that members of the media are able to attend. So a barrage of journalists, both foreign and domestic, are crowding the balcony at the Gran Hotel Ciudad de Mexico to get a glimpse of the action in Zocalo Square below. We were on hand and, trust us, there’s far more details to be gleaned than what the teaser trailer showed. The first scenes of Spectre take place in Mexico City, and Bond is on a mission. This is where he encounters the newly cast Stephanie Sigman as Estrella. 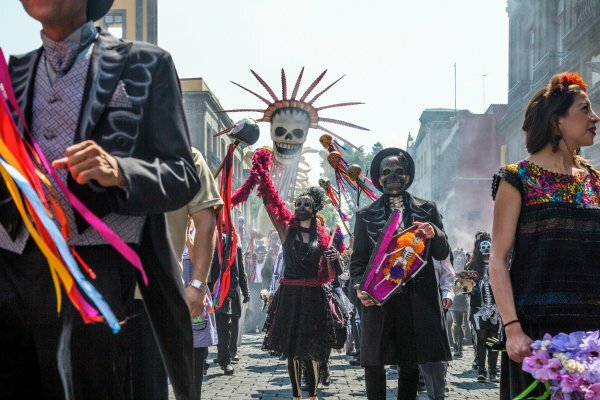 Her and Bond are weaving in and out of the Day of the Dead celebration, heading towards her hotel room. She thinks she’s bringing Bond to bed, but 007 has his eyes out the window. It’s while he's in the hotel that he spots two villains having a conversation across the way. Bond jumps into action. He stops "something really bad" from happening. The scuffle causes a building to explode, after which a chase commences. Marco Sciarra, played by Italian actor Alessandro Cremona, is pushing his way through the day’s festivities as Bond is in hot pursuit. (Worth noting is that actress Monica Belluci portrays "Bond Girl" Lucia Sciarra. We glimpsed her in the Spectre trailer at a funeral.) After Sciarra calls for backup on his phone, a helicopter descends into Zocalo Square. Sciarra bursts through the crowd of people dancing to the music and sprints for his only visible escape route. But Bond is on his heels. 007 fights his way through Sciarra’s cohorts and leaps onto the plane. The two grapple with each other as the craft is taking off. To give you an idea of what ensues, stunt pilot Chuck Aaron is manning the craft on the set. He is the only person insured to do 360-degree flips in this helicopter. Ponder that for a moment. A rep for Sony told us that some of the copter’s stunts are being filmed in Zocalo Square, while the others take place 10 hours outside of the city and are performed at a lower altitude. What I like to do is a musical note. What I like to do is basically take Beethoven’s Fifth here. The Day of the Dead is going to be the DUH-DUH-DUH DUH! And [sings the following melody] little pieces of information. … That’s the way a Bond film is going to play in the way I see things. Spectre hits theaters on November 6. We'll have more to report from the set in the coming days, so stay tuned!